Forty-five years ago, people across the world held their breaths as a hair-raising, heart-pounded descent occurred a quarter of a million miles away from Earth. At the Sea of Tranquility, on 20 July 1969, two humans succeeded in what many had considered impossible: landing and walking on the surface of another world. After a successful launch from the Kennedy Space Center and Trans-Lunar Injection burn, Neil Armstrong, Michael Collins, and Buzz Aldrin, aboard Apollo 11, were on their way to the moon. After leaving Low Earth Orbit, the Apollo 11 crew separated the Command/Service Module (CSM) from the third Stage of what was left of the mighty Saturn V rocket. CSM separation occurred at MET (Mission Elapsed Time) 3hrs 15mins 23secs. Following a series of engine burns, known as separation maneuvers, the CSM was flipped around so that its nose was pointed toward the third stage of the Saturn V – inside of which was the Lunar Module (LM). Under careful control by Michael Collins, the CSM eased toward the LM, connecting at MET 2hrs 24mins 3.7secs, or 12:56:03 EDT 16 July 1969. Over the next 53mins, connections between the CSM and the LM were confirmed and the joint vehicle’s health was examined. At MET 4hrs 17mins 3secs, Collins fired the CSM’s thrusters and backed the CSM/LM duo out of the third stage. Once clear, the crew performed the CSM/LM evasive maneuver burn to clear the spacecraft from the flight trajectory of the third stage. Once the CSM/LM was clear, vent valves on the LH2 and LOX tanks of the third stage opened in sequence to place the stage into a lunar slingshot trajectory – a course that would send the stage close enough to the moon’s surface for a gravity-assist maneuver to fling it clear of lunar orbit and into a heliocentric (solar) orbit. Over the course of the following 70hrs, in between sleep periods, the Apollo 11 crew conducted four (4) TV transmissions and performed a mid-course correction burn at MET 1day 2hrs 44mins 58sec (3sec burn duration). On day three of the mission, Armstrong and Aldrin entered the LM to perform initial inspections and checkouts of the LM systems. At MET 61hrs 39mins 55secs, Apollo 11 crossed the equigravisphere – the moment when the Earth’s and the moon’s gravity sphere’s were of equal strength relative to the Apollo 11 spacecraft. At that point, Apollo 11 was more influenced by the moon’s gravity than the Earth’s. After a sleep period, the crew awoke and prepared for one of the most mission-important parts of the flight: the Lunar Orbit Insertion burn. A successful burn would place Apollo 11 at a velocity slow enough to be captured by the moon’s gravity. At MET 75hrs 49mins 50.37secs, the SM engine fired for 5mins 57.53secs. The hair-raising burn was perfect, slowing the CSM/LM by just enough to be captured by the moon’s gravity into a non-circular lunar orbit. The lunar orbit circularization burn followed at 17:43:36 EDT and lasted for 16.88secs. Aldrin then entered the LM to perform initial system power-up and checkouts for the following day’s scheduled lunar landing. Once initial system preparations in the LM were complete, Aldrin reentered the CM, and the Apollo 11 crew entered a sleep period – the final sleep for Armstrong and Aldrin as non-moon walking men. After waking up on Flight Day 5, Armstrong and Aldrin entered the LM for final preparations for descent. 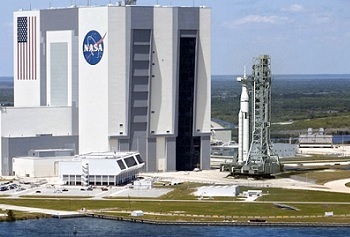 Final LM system checks began at 11:17 EDT, 20 July. LM systems checks wrapped with a clean bill of health at MET 100hrs. With the hatches between the LM and the CSM closed, Armstrong and Aldrin undocked from the CSM at 13:44 EDT, staying in close proximity to the CSM for the following 27mins 52secs. With everything in order, and with Mission Control’s approval, the CSM/LM separation maneuver began at 14:11:52 EDT and concluded nine (9) seconds later. The maneuver placed enough distance between the two spacecraft to allow for separate, safe operations of the CSM by Collins and the LM by Armstrong and Aldrin. For the next 56mins 13secs, the two spacecraft orbited the moon, waiting for the LM’s orbit to bring it to the point where it was to begin its descent to the surface. 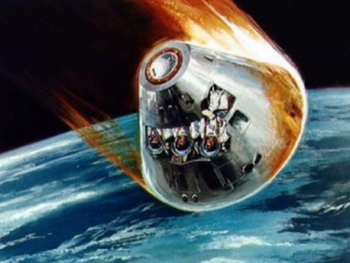 Armstrong and Aldrin fired the LM’s engine to begin the LM Descent Orbit Insertion burn. The burn lasted 30secs and placed the LM into an orbit with perigee close enough to the lunar surface to allow for a landing attempt. Armstrong and Aldrin activated the LM’s radar system. LM abort guidance was aligned to primary guidance to provide accurate information in the event that the landing had to be aborted. A communication improvement yaw maneuver was performed before the LM reached a lunar altitude of 50,000ft. Armstrong and Aldrin performed an LM propellant settling engine burn before executing the start of LM powered descent. 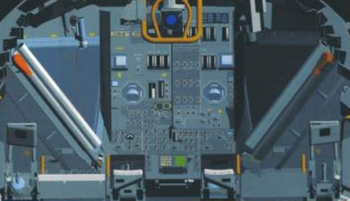 The LM engine reached fixed throttle, before Armstrong and Aldrin rotated the LM to the “face-up” position. 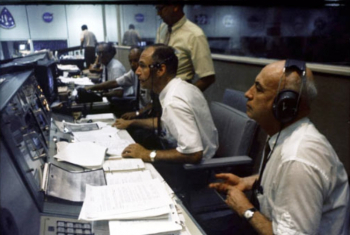 Mission Controller Jack Garman, looking at the data streaming in from the LM, quickly ascertained that it was safe to proceed with the landing – a decision that was quickly relayed to Armstrong and Aldrin. The alarm, and those that followed, were the LM’s response to an overflow of incoming data that overwhelmed the computers and caused them to be unable to complete all tasks in real time. 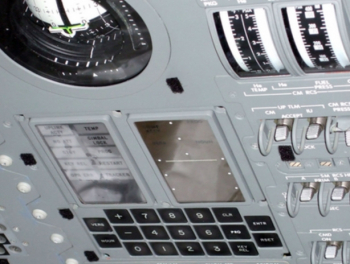 (The issue was traced to an error in the checklist manual that caused the rendezvous radar switch to be placed in the wrong position. As the descent continued, landing radar updates came online, and the LM reached a lunar altitude of less than 30,000ft (and a landing radar indicated velocity of 2,000 ft/s). Lunar surface approach phase began with LM landing radar antenna taken to position 2. Armstrong and Aldrin then initiated the LM attitude hold to check the LM’s handling qualities before committing to the final descent. Automatic guidance initiated and LM landing radar was switched to low scale at 16:14:19 EDT. At this point, with the lunar surface in clear view, and a much rockier terrain than expected, Armstrong made the decision to take semi-automatic control of the LM and manually fly until a smoother area was found. As Aldrin called out altitude and navigation, Armstrong initiated an altitude hold command and flew the LM horizontal above the lunar surface searching for a suitable area to land. Mission Control back in Houston watched as fuel consumption rose and fuel levels dropped. After several seconds, Armstrong finally spotted a site smooth enough for landing. LM descent landing phase began at 16:15:22 EDT. Radar data for landing became unusable at 16:16:11 EDT, returning to usable status at 16:16:21 EDT. The low-level fuel light activated at 16:16:28 EDT, causing great angst in Mission Control. As the LM slowly descended, low on fuel, the landing radar glitched again at 16:16:59 EDT, returning four seconds later at 16:17:03 EDT. Out the LM windows, as Armstrong and Aldrin neared the surface, lunar dust – for the first time in millions of years – kicked up from the surface as the LM’s engine interacted with the fine particulate. Only 25 seconds of fuel remained. The engine shut down. The dust settled away from the LM. The time was 16:17:39 EDT on 20 July 1969. As cheers erupted around the world, Apollo 11 landed on the moon. What came back was not the rehearsed call, but rather a changed confirmation on Armstrong’s part to make clear to the hundreds of millions of people watching on TV that landing had occurred. The official mission timeline called for Armstrong and Aldrin to enter a 5-hr sleep period following the successful landing. In consultation with Mission Control, the decision was made to skip the sleep period and begin preparations for the moonwalk. After planning where to place the Early Apollo Scientific Experiment Package (EASEP) and the U.S. flag by observing the lunar terrain outside the LM windows, Armstrong and Aldrin suited up. At 22:39:33 EDT, Armstrong opened the LM hatch. The first surprise that awaited him was not stepping out of the LM, but rather the difficulty of getting through the LM hatch. The LM hatch had been redesigned to be smaller, but the EVA suits and Portable Life Support System packs for the EVA suits were not subsequently redesigned to be smaller. This resulted in some tension and a higher-than-expected heart rate as Armstrong tried to squeeze through the slightly-too-small opening. 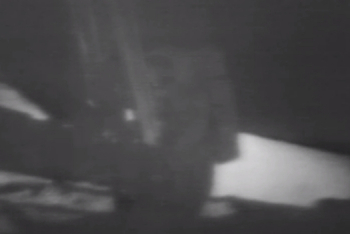 By 22:51:16 EDT, Armstrong was completely outside the LM, standing on the porch of the lander. Armstrong deployed the modular equipment stowage assembly at 22:53:18 EDT. Deployment of the equipment activated the TV camera attached to the side of the LM. The first clear TV pictures were received through Goldstone in the United States and (with better signal quality) at Honeysuckle Creek Tracking Station in Australia – later switched to Parkes Radio Telescope in Australia. 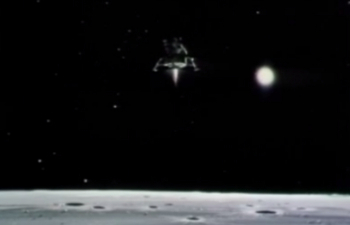 The camera on the lunar lander, though, was not a traditional TV camera. It was a slow-scan television camera that was incompatible with global commercial TV. As such, the images received were displayed on a special monitor, and a traditional TV camera was pointed at that to broadcast the event worldwide. The result was a significantly degraded image, but one that was still discernible. After descending the ladder on the leg of the LM, Armstrong stood on the foot of the LM’s landing leg. At this point, there was only one thing left to do. On 20 July 1969, 22:56:15 EDT (21 July 1969, 02:56:15 GMT), Neil Armstrong stepped off the foot of the LM and became the first human to set foot on the surface of the moon. The moment and historic step, broadcast live around the world, was watched by a global audience of 530 million (14 percent of the world’s population at the time) despite occurring in the middle of the night for Europe and Africa and not being broadcast, save in Romania, in the Soviet eastern bloc. At the time, Armstrong’s historic step was the most-watched event in history, a record it held for 39 years until the 2008 opening ceremonies of the Beijing Summer Olympics (as verified independently by researchers, not based on network and/or organization viewership claims). To this day, the first steps of humanity on the moon stands as the third most-watched event in human history – with, through verifiable means, only the 2008 Summer Olympic game’s closing and opening ceremonies surpassing Apollo 11. With Neil Armstrong’s foot on the moon, the first moonwalk in history began. And with that statement, controversy was born. It was not until the digital age, and 2006, that digital analysis of the audio files of Apollo 11 revealed the “a” (though there is still some question about it). It is currently held that Armstrong did say “a man,” but that the “a” was obscured during transmission due to storms near the Parkes Observatory in Australia. Regardless, the statement by Armstrong instantly became one of history’s most famous quotations and once again highlighted the nature of the mission as viewed by the Apollo 11 crew: a mission for everyone. 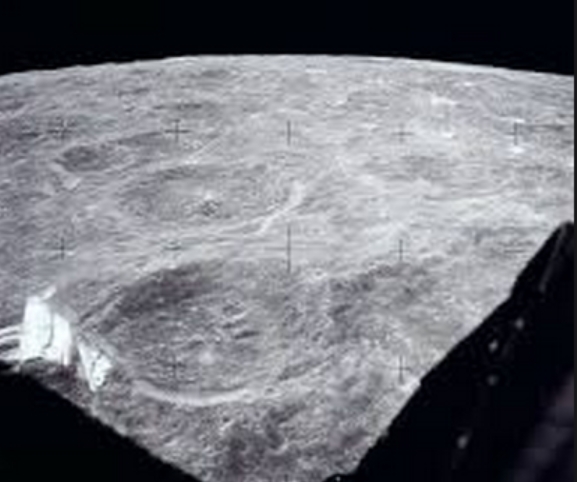 Following his statement, Armstrong began examination of mobility on the lunar surface (one-sixth the gravity of Earth) and description of the lunar surface. After this, at 20:58:54 EDT, Aldrin sent down a camera to Armstrong, who set up the camera on the LM landing gear to take photos of the lunar surface. Armstrong then collected a lunar contingency soil sample, ensuring that a lunar sample would be returned in the event that the EVA had to be terminated early. During Aldrin’s descent, Armstrong took photos to document the process for analysis after the mission returned to Earth. Aldrin became the second person on the moon at 23:15:16 EDT. With both Armstrong and Aldrin on the surface, the pair began an engineering examination (with photography) of the landing effects on the lunar surface and on the LM itself. After the examination, Armstrong adjusted the TV camera, unveiled the landing dedication plaque, and read it aloud to Earth. The plaque, depicting the entirety of planet Earth, carried the names and signatures of three people: Neil Armstrong, Michael Collins, Edwin Aldrin, and President Richard Nixon. Armstrong then realigned the camera and switched it to panoramic view while Aldrin deployed the Solar Wind Composition experiment. 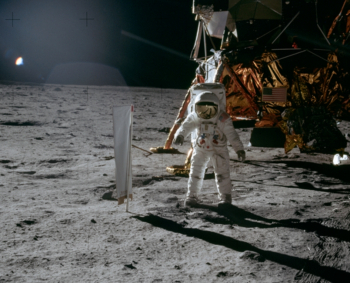 At 23:41:43 EDT, Armstrong and Aldrin deployed the specially designed American flag on the lunar surface. The conversation was brief, a suggestion made to President Nixon by Frank Borman, Apollo 11 White House-NASA liaison, in order to maintain respect for the lunar landing as the late-President Kennedy’s legacy. Over the next 1h 19mins, Armstrong and Aldrin evaluated lunar soil trajectory (after being kicked), visibility in lunar sunlight, thermal effects of sun and shadow regions inside their EVA suits, and surface shadows and colors. The duo also inspected the landing gear of the LM and took more engineering photos before deploying the passive seismometer experiment and collecting bulk surface samples (e.g., rocks). At 00:35:57 EDT on 21 July 1969, Armstrong deployed the Lunar Ranging Retroreflector (which continues to provide definitive proof against those who doubt the authenticity of the human lunar landing). At 00:52 EDT, Aldrin retrieved the Solar Wind Composition experiment, and at 01:01:30 EDT, ascended the ladder of the LM and ended his only lunar EVA. Armstrong then passed up additional sample containers to Aldrin, before he left the lunar surface. The first moonwalk ended with LM hatch closure at 01:11:13 EDT 21 July 1969. In total, the EVA lasted 2hrs 31mins 40secs. Of all the photos taken during the brief, first moonwalk, only one (good one) is of Armstrong. While the TV camera captured his first step and other activities on video, the moonwalk timeline called for Armstrong to have the mission’s only lunar surface camera for a majority of the EVA. The iconic photos of an astronaut saluting the American flag and staring straight into the camera are photos of Aldrin, not Armstrong. 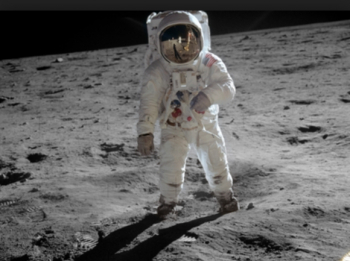 While Armstrong is seen in the helmet visor reflection of Aldrin’s suit in the staged photo of Aldrin staring into the camera, the only actual photo taken of Armstrong on the surface of the moon is one in which his back is to camera. The iconic photo of Armstrong, helmet off, smiling, exhausted, was taken in the LM after the completion of the historic moonwalk. After spending the night safely tucked inside the LM on the surface of the moon, Armstrong and Aldrin returned to the CSM on 21 July. At 13:54 EDT, Armstrong and Aldrin fired the LM’s ascent engine, burning the engine for 7mins 15secs. At 14:01:35 EDT, the Coelliptic Sequence Initiation burn began, lasting 4secs. This was followed by the Constant Differential Height Maneuver burn (40secs) and the Terminal Phase Initiation burn (23secs) to place the LM ascent stage onto the proper course to rendezvous with the CSM. After two midcourse correction burns, braking, and a Terminal Phase Finalization burn, the LM ascent stage arrived at stationkeeping with the CSM at 17:24:05 EDT in lunar orbit. CSM/LM ascent stage docking occurred at 17:35 EDT. After transferring all samples, experiments, and the camera from the LM to the CSM, the LM ascent stage was jettisoned from the CSM at 19:41:31 EDT, and Armstrong, Collins, and Aldrin prepared the CSM for the Trans-Earth Injection (TEI) burn to begin their journey back to the Earth. The TEI burn began at 00:55:42 EDT on 22 July and ended after 2mins 31secs. One midcourse correction burn was required at 16:01:57 EDT on 22 July. As the CSM approached Earth, the crew prepared the CM for separation from the SM and entry into Earth’s atmosphere.CM/SM separation occurred on 24 July at 12:21:12 EDT. The Apollo 11 CM entered Earth’s atmosphere at 12:35:05 EDT, its ablative heat shield taking the full-force of atmospheric aero-braking heating. After nine-minutes of entry, the CM’s drogue parachutes deployed, orienting the CM into a stable position for final velocity reduction and splashdown. Visual contact by recovery forces occurred at 12:39 EDT (by aircraft) and 12:40 EDT by the recovery ship the USS Hornet. VHF radio and recovery beacon contact were made at 12:46 EDT. After 6mins 29secs on the chutes, and despite predicted CM orientation, the Apollo 11 CM splashed down and quickly rolled nose first (opposite orientation of normal) under the water. Apollo 11 splashed down at 12:50:35 EDT on 24 July 1969 in the Pacific Ocean, 2,660 km (1,440 nmi) east of Wake Island and 380 km (210 nmi) south of Johnston Atoll at 13 degrees 19 minutes North 169 degrees 9minutes West. After 8mins in an upside down configuration, the crew deployed airbags to right the capsule. As recovery forces converged on Apollo 11, President Kennedy’s goal of “landing a man on the moon and returning him safely to Earth” before the end of the decade was realized. The mission of Apollo 11 was complete. The decision to make the most significant human spaceflight one of peace, not victory, set the theme of all the attempted and successful Apollo lunar landings. The spark of peace ignited by Apollo 11 carried forward beyond the lunar landings. From 15 July to 24 July 1975, spanning the six year anniversary of the Apollo 11 flight, the final crew of Apollo lifted off on a mission that was, when Armstrong and Aldrin set foot on the moon, beyond fantasy. On 17 July 1975, for the first time in history, the United States and the Union of Soviet Socialist Republics met in space. In peace. As the Apollo CM linked with the Soviet Soyuz, a significant moment of detente occurred. Seemingly unstoppable enemies of the Cold War, fighting for radically different political ideologies on the ground, were finally together in space, working together. It was the end of the space race. And that spark of peace carried forward into the 1990s as Atlantis, Discovery, and Endeavour became the first spacecraft to visit another country’s space station; and Russia’s space station Mir became the first nation’s space station to undergo construction and outfitting, in part, by another country’s space vehicle fleet. And Mir was just the precursor. 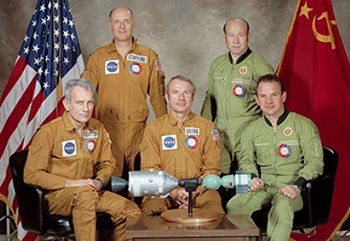 In November and December 1998, the peace sought by Apollo 11, forged in Apollo-Soyuz, and carried forward by Shuttle-Mir became permanent when Russia (in November) and NASA (in December) began the greatest joint operation in space history: the construction, outfitting, and permanent habitation and operation of the International Space Station. With Station, the European, Canadian, and Japanese cultures have permanently joined the endeavor, providing modules, experiments, payloads, robotic arms, robots, and resupply craft for continued operations of the ISS. And in the opening years of the current decade, private space companies from the United States have joined those government agencies. In the 45 years since Apollo 11 proved that what many thought was impossible was in fact possible, the world’s space faring nations have firmed their footing in space. We’ve suffered immeasurable loss, and we’ve achieved immeasurable scientific research success. We’ve bettered our quality of life. But above all, we have never stopped looking to the future. While it’s easier at times to focus on what we haven’t done yet and what we may no longer have, the world’s space programs have not diminished. They have thrived in the years since Apollo 11. And they continue to grow. The next giant leap for humanity in space is on the horizon. And we know what those destinations will be. As we look forward, as we make our move to mount human missions to another planet, the spirit of Apollo 11 becomes an ever-present necessity. The goal is not victory over another. The goal is collective success, one for everyone, achieved through desire, inspiration, persistence, and peaceful cooperation. Only through that can we take that next small step for ourselves and giant leap for humanity. (Images via NASA, NASA History, CBS Coverage of the events and L2).